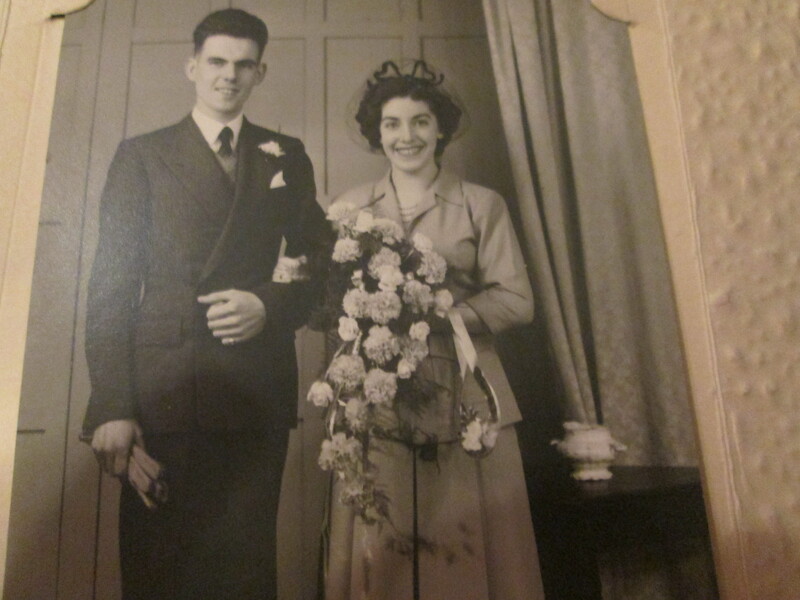 64 years ago my Mum and Dad got married. They met two years previous to that when my Dad was on home on his last leave from the Royal Navy. Mum had reluctantly agreed to attend a New Year’s Eve party with her friend. She recalls trudging across farmer’s fields to get there. She was with her friend, another Irene, and they met my Dad and his best mate, Colin. Dad always said he knew he would marry my Mum as soon as he met her. He nearly blew it altogether by standing her up on their first arranged date because his Mum disapproved of him going out with a Roman Catholic. That hiccup got resolved when they met at a dance hall and they started courting. The other Irene and Colin were going out together two so it was quite the foursome. Colin and Irene married and I suppose it was inevitable that Mum and Dad would follow suit. The photos of their wedding are lovely – two innocent young adults starting out on life together. They had a weekend in Blackpool prior to this happy day and both have reassured me and I believe them that they had single rooms and there was no what my son would refer to as funny business. Mum did not choose a white dress and had her own individual style in a blue suit. Dad looks smart as he always did. Both were incredibly good-looking. Like with most weddings, there was a little drama. Mum fell out with one of her sisters before the wedding so she did not attend. Most of my Dad’s family did not attend due to Mum being a Catholic. Mum used to recall walking into the church and seeing one side almost empty. They had to stay outside the altar rails and various other sanctions for being a mixed marriage. Their honeymoon was in a borrowed caravan at Cayton Bay on the East coast. Mum said she knew she had made a good choice when Dad warmed her nightie for her before bedtime. That story has always touched me. They started married life in a tiny house and were thrilled when they go a police house with Dad’s new job. Almost 2 years after getting married, they had one son and another followed 14 months later. Dad kept his faith and my mum hers for 10 years. Dad always attended Mass with her on Sundays and converted to the faith after a decade of learning all about it. They were very involved in church and community work. Their social life revolved around the church hall and the Irish National Club with the occasional Police Ball where Mum tended to turn up looking like a film star. Mum had a gall bladder operation which left her unable to have other children. She longed for a daughter and in 1969, they fostered me and the next year made it all official with my adoption. What were the strong points of their marriage? They really did the bit about being there for each other in sickness in health, for richer for poorer and all that. They both were rebels – I knew this about my Mum but it took me years to work out that Dad was rebellious too. She was talkative and he was taciturn unless there was something worth saying. They were both great story-tellers. She has a ribald sense of humour whereas he tended to be more strait-laced about things. They cared for the other one’s family. Mum cared for Dad’s grandma and parents. Dad helped her when my Uncle attempted suicide and when my other uncle was diagnosed with terminal cancer taking him into the family home. They prepared for death by teaching each other the roles the other had carried in the marriage. So Dad learned how to cook and clean. Mum learned about finances and DIY or at least Dad tried to teach her but she soon lost interest. Dad would do anything for Mum. If she wanted something, she got it. If she wanted to go anywhere, he would get her there. If she wanted to try something new, she would have his backing. I did not really see how much Mum was totally behind Dad too until after she became ill with cancer. She was so concerned he would not manage without her. After she died, Dad told me how she forgave him for silly misdemeanours like leaving her at home with two young boys after work whilst he went to the pub with colleagues. He got a shop after leaving the police force and when he got a new job, she kept the shop running for 11 years with young sons around her legs. When the stress of a case he handled late in his insurance career got to him, she supported him when he took early retirement. When I think about Mum and Dad I think about home and always feeling secure there. I think of great conversation and lots of laughter. I think of explorations and travel. Sadly, they did not quite make their 60th wedding anniversary missing it by just over a year. Kenneth and Irene, Irene and Kenneth – it just worked. Lovely story. Hope they’re having a great celebration wherever they are. Thanks. I am sure all couples have a special story but I was blessed to have such wonderful parents. Thanks for stopping by and leaving such a kind comment. Oh this is beautiful, it is so lovely to hear a proper love story and you were very lucky to have a Mum and Dad who loved and cared for each other. Oh, this gave me goosebumps. What a truly lovely story. Thanks for sharing with #TriumphantTales, please do come back on Tuesday to celebrate our 1st Birthday, we have a surprise in store! I think it’s really interesting how you as their child have come to realise aspects of their personality all these years later. I think many people will identify with making those kind of belated discoveries about people close to them.